LG V10 unveiled with Second Screen, Dual Front Cameras and Manual Video Mode. LG Electronics today took the wraps off its newest smartphone featuring multimedia capabilities never before seen in a mobile device. The first of its V Series phones, the LG V10 comes with distinctive new features such as a Second Screen, Dual Front Cameras and Manual Video Mode differentiate the LG V10 from the competition. LG is introducing a Second Screen as an inset display above the main 5.7-inch QHD IPS Quantum Display on the V10. Working independently, the Second Screen can be set up as an "always on" display to enhance the V10's productiveness all without impacting battery life. Set the Second Screen to display the weather, time, date and battery icon when the main display is off. With the main display on, the Second Screen can be set to convert to a dedicated launching area for shortcuts or your favorite apps. What's more, when you're enjoying a movie or game on the V10, the Second Screen will notify you discreetly without blocking your view when a call or text comes in. Ignoring the notification won't distract you from your enjoyment or you can pause whatever you’re doing to respond. The LG V10 features 5MP Dual Front Cameras with two separate lenses to capture standard 80 degree selfies or perfect wide angle selfies of 120 degrees, without the need to pan the smartphone which increases the likelihood of camera shake. For the wide angle shot, the V10 employs a sophisticated software algorithm to combine images from the two separate lenses which are just far enough apart to provide two different points of view. The ability to take group selfies without a selfie-stick has never been easier. Multi-view Recording can capture different angles utilizing all three cameras on the V10. Select and insert the version that looks best in your masterpiece. As the LG G4 did with photography, the LG V10 offers users the ultimate in video capturing, editing and sharing. The V10 is the first smartphone to offer manual mode for video. First introduced for still photographs on the G4, the technology has been enhanced to handle video recordings as well. With Manual Video Mode, budding directors can easily create professional-quality videos by adjusting options such as shutter speed, frame rate, ISO, white balance and focus while recording. Videos can be recorded in three resolutions - HD, FHD or UHD - and two aspect ratios - 16:9 standard or 21:9 cinematic. The V10 carries on LG's tradition of providing alternative storage options with a microSD card slot. Compatible with cards of up to 2TB, V10 owners can shoot as much 4K video as they want. And with the 3,000mAh removable battery, you can always be ready with a second or third replacement battery to pop in if you ever run low on power while shooting. And with Qualcomm Quick Charge 2.0 technology built-in, it only takes 40 minutes to get a 50 percent charge. As an advanced multimedia smartphone, the sound in the V10 has been designed to be best-in-class. The V10 features 32 bit Hi-Fi DAC by ESS Technology, designers of high-performance audio products for professionals. 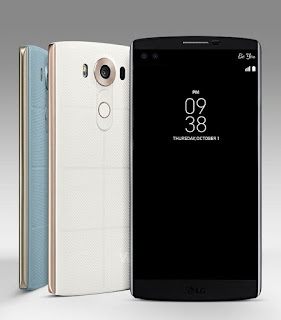 The LG V10 automatically detects connected devices and provides sound control options which can be customized. And the LG V10 is the first commercial device to utilize Qualcomm Technologies TruSignal antenna boost technology designed to intelligently optimize signal strength at all times for fewer dropped calls, faster data and better call coverage, no matter how the phone is held. Along with the popular Knock Code, the LG V10 features a new fingerprint sensor to unlock the smartphone and turn on the display simultaneously. The sensor also works with Android Pay in the United States to make purchases as quick and easy as possible. The LG V10 will be available in Korea starting this month followed by markets such as the United States, China and key countries in Asia, Latin America and the Middle East.